Acts in an inappropriate and/or undesirable manner whilst traveling to the Park whether by bus, coach or other means. Where such behaviour has been reported to Crealy. Has behaved in, or in the vicinity of, the Park in a manner, which, in the opinion of Crealy, has, or is likely to affect the safety and enjoyment of other guests or staff. Uses threatening, abusive or insulting words or behaviour in any way shape or form that provokes or behaves in a manner which may provoke a breach of the peace. We are prepared to allow entry to the park to those visitors who are willing to comply with the Park regulations set out below. We are sure that you will wish to assist Crealy in ensuring the Park and facilities remain a safe place in which to enjoy a fun and exciting experience. Whilst inside the Park all visitors must comply with any instructions given to them by Crealy personnel. Admission tickets are non-exchangeable, non-refundable and void if altered. Admission tickets will only be exchanged or refunded if Crealy, in its absolute discretion, chooses to do so. We regret that due to our zoo license conditions we no longer allow dogs on park. Any person found to be in the possession of an article deemed to be offensive of dangerous would be immediately escorted from the Park without the right to refund and be open to prosecution. The consumption of alcohol is permitted only in authorised places within the Park. Accordingly alcohol may not be taken into the Park. Guests who appear to be under the influence of alcohol may be refused admission to the Park or escorted from the Park without right to refund. The use of illegal substances is strictly prohibited and any persons found possessing, using or who appear to be under the influence of illegal substances will be refused admission or escorted from the Park without right to a refund. Crealy will endeavour to ensure that as many rides and attractions as possible are available for use by guests. Crealy reserve the right, without prior notice and without refund or compensation to close and/or chance the programme of rides and attractions and/or the Park's operation hours. All rides, attractions, amusements, transport systems and other facilities must only be used in accordance with the operator's instructions. Climbing or standing upon fences, barriers, walls, safety fences, rock arrangements, ride structures, exhibits or buildings is strictly prohibited. Crealy reserves the right to prosecute any person found damaging or defacing any part of the grounds, fences, barriers, walls, ride structures, exhibits, fabrics or buildings and to initiate legal proceedings if appropriate. No vehicles are permitted to remain in the Park outside the Park's normal operating hours without the prior express permission of the security duty manager, who retains absolute discretion as to whether such permission is granted. From time to time Crealy or other authorised parties carry out photography and/or video recording at the Park, which may feature visitors. Crealy takes no responsibility for any loss or damage to such belongings. Sensible clothing and footwear must be worn at all times when in and about the Park. Please note that for health and safety reasons shirts and shoes must be worn on all rides at all times. Vehicles are parked at owner's risk. Crealy takes no responsibility for damage caused to any vehicle using the car park. You park at your own risk; we do not guarantee the security of your vehicle and/or its contents. By entering the Park you consent to us photographing or filming you and using the resulting pictures for any promotional purpose without payment to you. If you do not wish to be photographed or filmed, please contact Guest Services upon arrival that will be able to advise you further. Height, age and weight restrictions apply to many of the attractions. £15 tickets will not be available over the phone or on the admission gate on the day. Tickets must be validated before leaving the Theme Park for your free return. This voucher is valid for up to 6 people. This voucher will entitle you to 25% off at the main ticket office on the Theme Park. This voucher is only valid against full price individual tickets. This voucher is only valid against tickets purchased at the main ticket office on the Theme Park. This voucher is NOT valid against tickets purchased online, prepaid tickets or tickets purchased in advance. This voucher cannot be used in conjunction with any other voucher or offer. This voucher is not for resale and is non-refundable, has NO cash value. Only original vouchers can be used. No scanned, damaged or photo copied vouchers will be accepted. Children under the age of 16 can only enter the park with a responsible adult aged 18+ years. Whilst in the park all children must remain under the control or supervision of an adult at all times. Children under 92cm in height are admitted free into the Park. For your safety some rides have height, age and other health restrictions. Please see the individual ride signage for further details. Some rides and attractions are closed during certain times of the year; please check our website before deciding to visit to avoid disappointment. Park tickets are non- changeable and non-refundable. 20% off admission prices (full price tickets and concessions) when you book online up to the day before your visit. Don't forget to validate your tickets at Guest Services for the 6 day FREE Return - only valid during selected dates. Click here for more information. The Pit Stop Pass is valid for 12 months from the day of purchase (subject to a valid Annual Pass). The Pit Stop Pass can only be used by those Annual Pass holders whose Annual Pass number is linked (displayed) on the reverse of the pass. The Pit Stop Pass is non transferable to any other Annual Pass holders. The Pit Stop Pass must be shown to the ride operator along with a valid linked Annual Pass. The Pit Stop Pass is non refundable. Go Karts may be closed subject to rain or other adverse weather conditions. All Pit Stop Pass holders must adhere to the regular Crealy Grand Prix rules and regulations as displayed at the entrance to the ride. Lost cards will be subject to a £1 replacement charge. Receipt must be exchanged for token at Guest Services. Receipt has no cash value. Tokens are the responsibility of the individual. Without a token you cannot experience the ride. Ride may close due to wet weather conditions. Photocopies/duplicates will not be accepted. Please examine your ticket immediately upon receipt as mistakes cannot be rectified on the day of admission. Ticket should be presented at the ticket office to gain entry to the Park. Replacements for lost tickets will not be issued and there will be no refunds for unused tickets. Some rides have height, age and health restrictions for safety reasons. See website for details. Visitors are reminded that for technical, operational, weather or for any other reasons, any attraction, ride or facility may be altered, closed, removed or be otherwise unavailable at any time without prior notice. Limited opening times of some attractions & rides will operate during certain periods of the year. All normal terms and conditions of entry to Crealy Theme Park & Resort apply. Please refer to our website for our full Terms and Conditions. Crealy Theme Park & Resort is a non-smoking park. There is one designated smoking area on the park. The Dome behind the Carousel this is the only area where smoking is allowed. Smoking is not permitted in any other outdoor spaces including ride queue-lines. The policy above also applies to electronic cigarettes. When you pay either the for a full individual ticket price or a concession priced ticket for a visit to Crealy Theme Park, you will be entitled to return free of charge for the following six days during selected opening times throughout the year. To activate this offer while you are at Crealy, please visit the Guest Services kiosk located inside the Park or the Ticket Office with your admission receipt before you leave on your first paid visit. To receive a return ticket a photograph will be taken and matched with your receipt reference; this will entitle those photographed individuals to return. All 741 tickets must be produced at the main ticket office on every subsequent visit and will automatically expire six days after its validation. This offer also includes tickets purchased online. Tickets are non-transferable, non-refundable and void if altered. 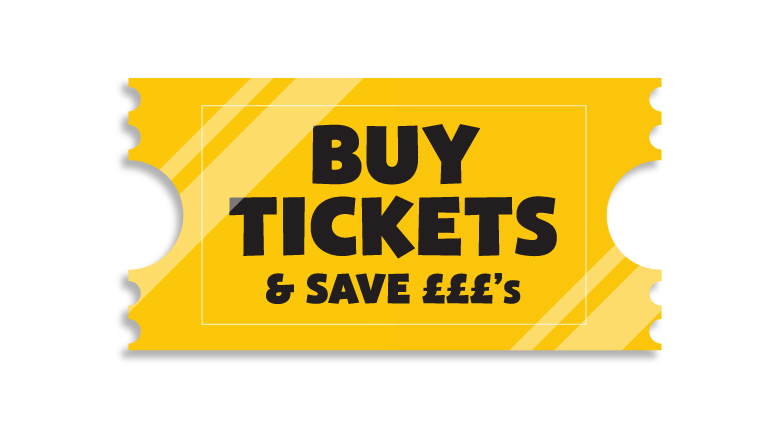 Our 7 day for the price of 1 offer is not valid with pre-paid special rate tickets, corporate tickets, including group rate tickets, complimentary tickets or our low season £6.95 & £7.95 tickets. Crealy reserves the right to remove this offer at any time. Group rates are available to all organised groups who pay in advance with a minimum of 15 paying guests. A 20% deposit is to be made by cash or card in order to secure a booking. Invoices will only be made to schools who have agreed to the payment terms of paying the full balance by cheque or BACS 14 days prior to the visit. Once full payment is made to Crealy by cash or card only, you will receive the final confirmation by email. Your booking confirmation must be presented at the ticket office to gain entry into the park. Wristband will be issued to everyone entering the park depending on the type of event. Entry will be denied unless they are securely fastened around your wrist. Wristbands are valid for one day only. An additional damage deposit of £100 (per 100 people) will be debited from a credit card at this stage and, subject to damage, repair, breakages and unnecessary clean-up operations. Anyone seen to be misusing the park, will not be allowed to stay on site and may jeopardise the fun for the remaining guests as the event may have to be closed early. The Damage Deposit will only be refunded to the guest once the Duty Manager (Senior Management) is happy that no damage has been done to the property of Crealy. This can take up to 7 working days to be refunded to the original card that made the payment. The final balance payment is due 14 days prior to arrival. If we do not receive your final balance payment 14 days before arrival, your booking will automatically be cancelled and no refund will be given. It is against Crealy Theme Park & Resort policy for Event Organisers to sell tickets on the door. Any Event Organiser who sells tickets on the door will be asked to stop immediately. If, for any reason, you would like to amend your booking after it has been confirmed we will do our best to assist you. If you wish to amend your booking and provide us with more than 7 days’ notice prior to arrival date then no charge will be made. If you wish to amend your booking and provide us with less than 7 days’ notice then a cancellation charge will be added to your balance of £25. However, you may transfer your booking into someone else's name provided we are advised of, and are in agreement with, the changes, for which there is no administration fee payable. If, for any reason, you have to cancel your visit you should contact Crealy immediately on 01395 233200. The reasons for any such cancellations will be considered sympathetically and, if requested by you, we will attempt to offer you alternative dates. Once a booking has been made it is non-transferable, cannot be sold, and is non-refundable unless otherwise stated in the cancellation policy. Only persons authorised are permitted to sell or offer any tickets to guests within Crealy Theme Park & Resort. All tickets and wrist bands are non-transferable and not for resale, if this is done these tickets/wrist bands will become automatically void. Where a refund is to be made by Crealy Theme Park & Resort, payments made by credit or debit cards will be refunded via the same card number less any non-refundable deposit and any other non-refundable amount. No children under the age of 16 will be admitted to the park unless they are accompanied by an adult aged 18 years or over and such child or children whilst on site must remain under the control or supervision of an adult at all times. Crealy reserves the right, in its absolute discretion to change the age restrictions referred to in this condition, if any particular circumstances so require in the interests of safety and security. Park Opening Times and Attractions vary across the year. Please visit the website for up to date information. Rides can close for safety reasons at any time. Management reserve right to refuse entry to the event as a result of any anti-social behaviour including line jumping, drunk, disorderly, abusive behaviour. Inappropriate behaviour may result in expulsion from the event without refund. Security will refuse entry to anyone drunk. Refusal to be searched will result in refusal of entry. Clothing and or bag searches on arrival if deemed necessary (female security staff will search females if required). Guests are not permitted to bring alcohol to the event, any alcohol or illegal substances found will be confiscated and destroyed. All events are drug free. Alcohol is served within specified bar areas at Crealy for over 18's only. Photographic Identification will be required and will only be accepted in the form of driving license, passports or Over 18 Pass cards. Failure to produce this will result in refusal of the sale of alcohol. The Event organiser should arrive at least 15 minutes prior to the start of the event and make themselves known to the Evening Duty Manager. In the unfortunate event of this Agreement being terminated by the event organiser, the deposit is non-refundable. Should Crealy Theme Park & Resort be misled or misinformed in any way regarding the nature of the event, or the number of attendees or for any other reason, Crealy Theme Park & Resort reserves the right to cancel the event and reclaim any costs incurred from the person or group organizing the event. Such costs could include but are not limited to, food already purchased Crealy Theme Park & Resort staff costs, Security costs and the 20% booking deposit will not be refunded. Please note that once your booking has been complete we will only be able to discuss the booking with the lead Organiser. The lead organiser will be the person who makes the booking with us. Unfortunately we will be unable to give out any information regarding the booking to any other members of the party. Once full payment has been paid you will receive a final booking confirmation, you will need to bring this with you as proof of your birthday package. You will receive wristband. Please be aware that our Atlantis Birthday Parties will come with 1 Ride Operator as standard. If you would like to add any extra ride operators it will come at a cost of £100.00 per extra operator. You can contact our helpful team on 01395 233200 to add an extra operators. All requests for charitable support must be e-mailed to fun@crealy.co.uk at least 6 weeks prior to the event. The e-mail must contain details of the event itself (including times, dates and locations), the cause, the person requesting and there must be a telephone number and postal address included also. Please also explain to us briefly why you feel we should support your event. Please note that Crealy does not give financial sponsorship towards any organisation – we only give tickets as raffle prizes to selected charitable causes. Your request for assistance will be reviewed in line with the other requests we have received and we will donate tickets where possible, however – whilst we try our best to support as many good causes as possible over the course of the year – please note that this cannot be guaranteed for all events. Tickets should be presented at the ticket office to gain complimentary entry to the Park. Photocopied tickets will not be accepted. Please refer to our website for our full Terms and Conditions. Complimentary and discounted voucher tickets are valid until 31st October on the year that they were issued. Voucher is valid at Blackbeard’s Chicken Shack, Adventurers food court, Route 66, Beach Bar, Hotdogs, Subs and Salads and Beach Bar. Voucher is only applicable to main meals and meal deals, not valid on snacks, Ice Creams, Beverages and confectionary. Voucher cannot be used in conjunction with any other Promotion or discount. Promotion can be withdrawn at any time and is subject to availability. The customer must show and surrender the voucher before ordering. If you lose your voucher, it will not be replaced. Subject to availability and restaurant opening hours. Voucher only valid on date of online booking to visit the park. A Crealy Gift Card can be redeemed for full or part payment against Theme Park entry, annual passes, and purchases at all of the Resorts food and retail outlets. Gift Cards will be treated as cash – lost, stolen or damaged cards cannot be replaced. A Gift Card cannot be exchanged for cash and no change or refunds will be given. Gift Cards will expire 18 months after the date of purchase – any remaining balances will not be refunded. The minimum single amount to be preloaded load on to a Crealy Gift Card is £10. Provided a Gift Card has not expired any remaining balances can be used against future purchases. Presenting the Gift Card at the main ticket office or at Guest services. The Gift Card will be scanned and receipt showing the remaining balances and expiry date will be returned to the card holder. Or by calling our Call centre with the Gift Card number. Only original Gift Cards will be accepted On-Park. No paper copies or digital images presented on a mobile device will be accepted under any circumstances. Crealy Gift cards can be purchased either over the telephone or whilst at the park. The management reserve the right to withdraw the Crealy gift card service without any prior notice. Sales of Crealy Gift Cards are made, managed and fulfilled by Crealy Theme Park & Resort - a trading name of Maximum Fun LTD. Sidmouth Road, Clyst St Mary, Devon, EX5 1DR. Crealy Gift Cards cannot be exchanged for cash and cash refunds will not be available for products purchased with this card. Crealy Gift Cards cannot be used against any online purchases and are only usable at Crealy Facilities. When using a Blue Peter badge to gain free entry to the park, each child must be accompanied with a full paying adult. The adults must purchase their tickets at full price on the day and not the discount rate which is available online.